Starring in a bad “Silence Of The Lambs” homage story is every lady cop’s nightmare. Goliath is still distraught over losing the gargoyle egg despite everyone’s best efforts to cheer him up. Elisa is distracted from aiding her friend, however, when a serial killer matching the MO of the one she put away, thus earning her detective’s badge, is on the loose. At first she isn’t sure who to turn to and the Gargoyles go off on their own adventures, so she handles the case alone and comes across the killer, who looks just as the man she put away said he did. Meanwhile, the young trio takes Bronx to what they think are abandoned tunnels for exercise only to find their actually in subway tunnels. Bronx chases after the train (being the dog-like one) and the others chase after him, leading to a back-up story next issue. What they got right: The plot, and even the subplot with Bronx, sound like something that could of worked on the show. Outside of the prostitutes of course. It was for older kids but still kids. I’m kind of sorry a story about one of Elisa’s old cases, specifically the one that led to her becoming a detective, coming back to make her question whether she deserved her badge, wasn’t on the show. Bronx’s story potentially would have worked, at least for The Goliath Chronicles, which was a bit lighter due to being on Saturday mornings. What they got wrong: Outside of Hudson’s TV watching still being a bit too obsessive not much. Which is why I can’t figure out what it is about this issue that I’m not able to connect with versus the last two issues. Is it the dream sequences? Pacing seemed okay. Something about today perhaps? I wish I knew what it was, but maybe the conclusion next issue will help me figure it out. I hope. Recommendation: I guess it’s worth checking out. It doesn’t feel as off as the early issues but I can’t put my finger on what it is this issue that bothers me. 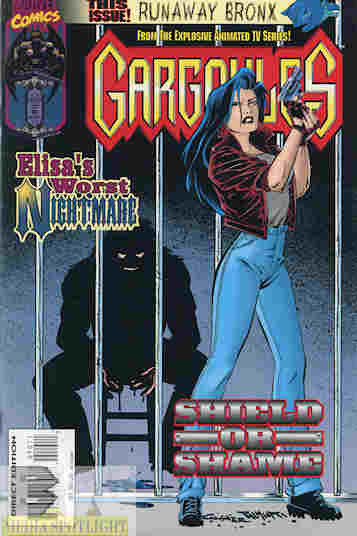 Posted by ShadowWing Tronix on March 14, 2018 in Animation Spotlight, Television Spotlight, Yesterday's Comics and tagged Bronx (Gargoyles), Elisa Maza, Gargoyles, Marvel Comics.